This is where I post about my own limited historical studies and things that catch my interest on the History channel. Last week, my wife Adriana and I took a short trip to Florence. She had been there before, but it way my first time in Italy. It was a small holiday for us and a chance to relax, just the two of us. The kids stayed home with their abuelo. We spent five days and the weather was mostly glorious. The first couple of days we did have a bit of overcast, and it was unseasonably warm according to the Italians. One of waiters told us that this kind of extra warm weather never used to happen in September, but in the last five years, it's become the new normal. We stayed in a very nice hotel just a couple of blocks from the Duomo and walked around the old city, checking out the cathedral, the Palazzo Vecchio, the Ponte Vecchio, the Pitti Palace with its Boboli Gardens, the Uffizi Museum and just generally soaking in the atmosphere and savoring the wonderful food. On Saturday, we took a high speed train over to Venice and had lunch. We returned to Florence that evening with enough time left to enjoy the best spaghetti and roast chicken meal I've ever tasted, and a wonderful bottle of Brunello di Montalicino in a little cafe a few blocks on the other side of the cathedral. On Sunday, we wandered the Uffizi Gallery. Adriana lingered in the Botticelli gallery, while I liked the sculpture. It's nice to see a famous painting in person, if for no other reason than to put it into scale and realize that it's a real work by a real human being. The Birth of Venus is nice, but I kind of preferred the Dyptich of "The Return of Judith to Bethulia". It's so wonderfully bloodthirsty and vibrant. The great Algerian novelist and philosophical writer, Albert Camus, was born on this day one hundred years ago, in 1913. If he hadn't died at the criminally young age of 46 in a car accident in 1960, he would be 100 years old today. Happy birthday, Msr. Camus. There's a great article about him and the things many people don't know about him, over at the Huffington Post today. The article is by Professor Robert Zaretzky, a history professor at the University of Houston. Why is this important? Well, personally, Albert Camus' writings and outlook are at the core of my own personal beliefs and philosophy. And he was a genuinely heroic guy. He actually journeyed into Vichy France during World War II and took up a leading, very risky position in the French Resistance. He edited the underground resistance newspaper, Combat, all through the war. Unlike many intellectuals, he stood behind his beliefs no matter what the risk. And he fought injustice wherever he saw it using the tool he had at hand, which is to write about it, whether it was about the Nazis, or how the Berbers were treated in Algeria, or how the poor were treated in France and the United States. Between that, his generally progressive politics while simultaneously being one of the few French or English liberals who didn't fall for the Soviet lies about the promise of communism, his frank musings about the morality and justness, or lack thereof, of the acts of murder and suicide, and his fundamental concept of The Absurd, are all vastly, hugely important contributions to human history and thought. I was raised as a Methodist by my very pragmattic but good-natured parents. I went to Sunday school and church and everything, up until about the age of 16. Then I spent about 30 years NOT thinking much about religion. Recently, for some reason, it's been in my mind. I'd say I've always had a rationalist tendency. My coursework as an undergrad, after all, was physics. But the increasing signs of religious intolerance I've seen in the United States lately has me worried. I worry what all of these evangelicals will do if they ever get too much power in our culture. I recently came across a question in an online forum, "Why do many rationalists, humanists, agnostics, and atheists care about religion? Why do they spend time arguing with religious people?" My response was a bit strongly worded, surprising even myself. 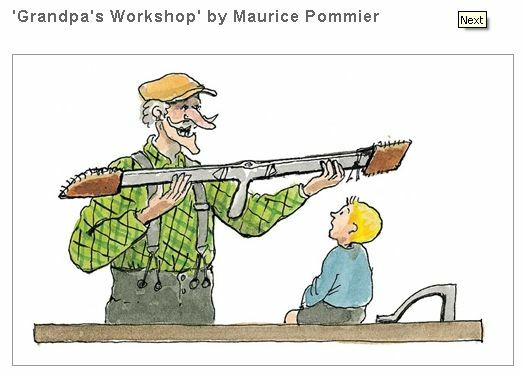 I recently read (and reviewed) Maurice Pommier's children's bookabout woodworking called GrandPa's Workshop. It's a charming book and it introduced me to the uniquely French tool called the besaigue. To a modern American woodworker's eyes, it's an odd, ungainly looking tool, but after hearing how it might be used, I've come to see how it could actually be useful in the right situation. A besaigue, pronounced as best as I can determine as Bay-say-gwe', is a long, double-tipped chisel, with a mortising chisel on one end, and a broad, flat chisel or firmer chisel on the other end. In the middle is a long rod with a handle attached at the midpoint. The purpose of the tool is for timber framing. The long end not being used is placed on the shoulder, and the handle is used to pare down or punch down into a beam to create a mortise. From other reading, it seems to have been commonly used up until perhaps the 17th century along with a large brace and bit to create round-ended mortise slots for structural timbers. What I didn't learn from this reading, however, is whether or how this tool was ever used in the English-speaking world. Anyway, Ben's Mill sits right next to the Stevens River near Barnet, VT. A foundation was formed to restore the mill to working operation so it could be used as a teaching tool to show how woodworking and water based machinery worked in 18th and 19th century New England. The movie is fascinating. (A portion of it is available for streaming on the FolkStreams website (see attached).) They've done some good work cataloging all of the old machines and restoring the old penstock (wooden tube that feeds water to the turbine), as well as the blacksmith area and the foundations. They still have permitting issues to deal with before they can rebuild the dam that finally washed away in the late 80s.